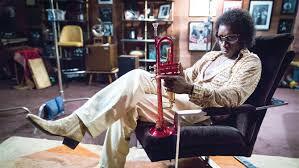 Miles Ahead is the new biopic of Miles Davis, one of the great, if not the greatest, jazz trumpeter and composer of all times. It’s written by Steven Baigelman and the director and star Don Cheadle. The filmmakers do everything they can, from non-linear storytelling to all sorts of directorial flourishes, to keep the audience enthralled. And they succeed, at least for a while. Flashbacks, jump cuts and various stylistic juxtapositions that feel inspired by jazz music, give the film a certain electric immediacy. But it’s not long before it feels that all this tinsel and sawdust is, well, not a lot more than tinsel and sawdust, there to hide the fact that in the end, the movie, though often entertaining, is really just another, as I and a friend like to call it, typical Warner Brothers biopic, the reference being the prestige pictures of the studios made in their heydays, like The Story of Louis Pasteur, The Life of Emil Zola and even more recently, Gandhi. All worthy, but all still somewhat bland. The plot is held together by a surrounding story that focuses on a clever and ambitious, if somewhat disingenuous, writer trying to do a profile on the great musician’s comeback for Rolling Stone Magazine, while everyone around him is trying to get their hands on a tape that contains the sessions of new music by Davis (valuable because Miles hasn’t performed or recorded for five years). This part actually had the potential of being a first rate neo-noir farce. 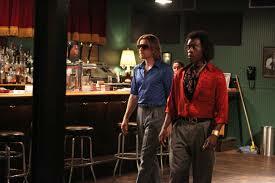 Instead it just serves as a Macguffin to allow the filmmakers to tell Miles’ life story. The main reason to see the film is Cheadle’s breathless (both metaphorically and literally, since Miles always had a smoker’s voice) performance. It certainly is all his show to lose, but he holds it together with a grating whisper. He also demonstrates skill in telling a story as a director. His direction may call attention to itself, but that doesn’t take away from the dexterity it shows. Ewan McGregor plays the reporter as if he’s along for the ride (which he is). Emayatzy Corinealdi is Frances Taylor, Miles’ wife. She gives it all she’s got, but the character, the long suffering wife, has been seen so often, over and over and over again through the years, it’s a little hard to feel sorry for her. Taylor never becomes a real person in her own right. With Michael Stuhlbarg as a sleazy agent. He’s a good actor, but his character feels a bit false, like his sideburns and mustache. I do have my first predictions for the Oscars. People are saying that Miles Ahead, and the yet to be released Birth of a Nation, will be front and center at the Academy Awards. I agree, but that’s not my prediction. I predict that the 2016 Oscars will have a larger number of blacks being nominated, both in front of and behind the cameras, upon which all the old white guys in the Academy will say, “See, we told you that there’s no problem with Oscars So White” (similar to what was said when Obama was elected and then reelected). Hey good review. I still need to write one. I think you answered my question to myself about the film why did it feel like a TV episode. It felt like that because the characters didn’t get developed very well especially Francis. Also, b/c of where the story picks up on the life of Miles it’s like we are already supposed to know him and want him to return to music. Really wish they would have just given us a full bio pic a “Ray”esque film. The only thing we didn’t get was lip-synced covers of Miles tunes but at the same time the film did nothing to introduce a newcomer to his music. 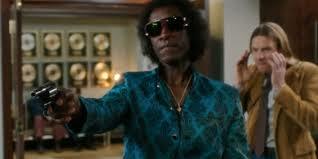 Don Cheadle was great I totally agree and I also agree on your Oscar prediction. Thanks. I did join lambs. It looks interesting. I’m glad you mentioned it. You both seem to have nice spin on reviews. Also, you might want to join lamb http://www.largeassmovieblogs.com/ if I haven’t suggested before.